The next Research Triangle & "borderline criminal"
Steve Pagliuca, candidate for US Senate, was on the WGBH Greater Boston show with Emily Rooney discussing his candidacy. Go to 2:3o in the interview and hear Steve and Emily talk about Steve's ideas for using Harvard's empty Allston land to create the next Research Triangle Park. Pagliuca: I've had conversations with Harvard Business School, several universities, several CEOs, and an idea that we are talking about is - you've got a site over there at Harvard that isn't be developed now because of the problems with the endowment. We should have a federal, state, university - all the universities - partnership to get that thing going. To make it a cluster of biotechnology. Rooney: That's borderline a criminal situation what Harvard has done over there. They let the City down, they let the university down, the neighbors are up in arms. Its almost like 90 acres of a vacant lot over there. If so, call Mark Vogel at the Animal Rescue League. For more than a year, many Allston and Brighton residents and our elected officials have been asking Harvard, the BRA, and Charlesview to provide more transparency regarding the Charlesview relocation. For one example of such a request, see the page 8 of the Charlesview PNF Comment Letters. One reason for this is to allow for independent analysis of the project's financing. Will there be sufficient money to build the new buildings with quality materials and construction? Will there will be enough money in the future for ongoing maintenance? Harvard, the BRA, and Charlesview have resisted providing this information, so on August 17 I submitted a public records request to the BRA for records relating to the Charlesview relocation. There was some back-and-forth before the BRA would agree to provide them, and then the BRA attempted to charge a $560.39 search fee and $0.20 per page for photocopying. Thanks to Councilor Ciommo for getting the BRA to waive this fee. BRA staff show a level of disrespect and hostility toward residents in Allston and Brighton that I didn't expect to see. A wide range of people - from Mayor Menino, Michael Kineavy, and BRA Director Palmieri on down through the ranks - have been informed and involved in the details of this project. Many seemingly small issues get input from many people and many emails have a long list of cc's. Harvard didn't seem happy back in February 2008 at the idea that the project might be increased to include the former Frugal Fannies building (which is now part of the proposed new Charlesview site). Remember, the next Charlesview meeting is Monday, 6pm at the Honan Library. Please join us. Our elderly dog Shaggy has a growth on one of her toes, and I wasn't feeling particularly enthusiastic about subjecting her to the x-rays, biopsy, and whatever else her usual vet would probably want to do and the several hundred dollar expense that would come with it. So I tried the Merwin Memorial Free Clinic for Animals in Allston yesterday. Reviews on Yelp love it and I was impressed too. They open at noon on most days and people often being queuing up well before then. We got there at 11:30 and were 5th in line. I don't think they schedule appointments and work purely on a first-come first-served system. Shortly after noon several more people arrived, so if you are short on time this may not be the place for you. At 12:30 we saw the vet for a quick consultation. He suggested that so long as Shaggy doesn't seem to be in pain and the growth doesn't start to bleed or look infected that it probably doesn't need treatment. That sounds like good advice to me and the optional donation was a great deal. The Merwin Clinic doesn't handle emergencies or complicated procedures. But if your pet needs vaccination, spaying, or neutering, I think the Merwin Clinic is worth considering. Today was one of those days that made me feel so good about our neighborhood and what we as neighbors can do together. Several of us spent the morning planting almost 50 new shrubs and other perennials on the Everett St slope between Lincoln and Adamson Streets. Sunday's rain will be a welcome drink for these new additions. As always, Mahoney's Garden Center on Western Ave was a great help, providing plants at a significant discount, consulting on plant selection, and delivery to the site. Mahoney's has a lot of great fall arrivals in stock and is a great source for supplies when you are decorating for Halloween and Thanksgiving. Please help support this great locally owned business. The transformation at this site in the last year has been amazing. Meeting so many neighbors and working together to beautify our neighborhood has been so rewarding. Today a new friend brought strawberries transplanted from her garden and hand-gathered flower seeds. We dug more holes today than we had plants, so will be back at it next Sunday (Oct 4) from 9-12 to put shrubs in these holes and spread the wildflower seeds that we expect will arrive this week. It would be great to have you join us. Later this fall we will plant daffodils. Stay tuned for details. 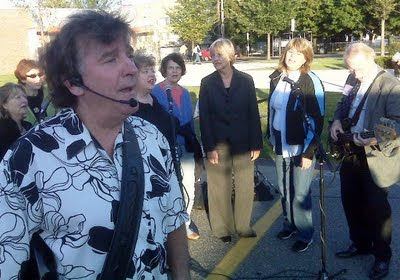 What a treat to be entertained by Tim McHale and the wonderful Minstrels today at today's farmers' market. And so nice of President Faust to help out with backup vocals. It would be inappropriate for me to share details of my conversation with Faust about Charlesview. But I will say that I was very disappointed by what she had to offer. "need to engage the world, locally and globally — as responsible citizens committed to public purposes, as students and scholars ready to help solve complex problems with rigor and imagination, as people who live by the ethical standards we teach, as individuals who repay the privilege of being in a rare place like this by using our knowledge to help advance the well-being of people in the world beyond our walls." To succeed in supporting what is most important, we’ll need to decide there are certain things we will not do, and certain areas where we will have to make do with less. we need to move — promptly but thoughtfully — toward what others have called “a new normal.” That means not entertaining the illusion that, if we’d just close our eyes and wait a bit, our economic situation would simply bounce back to where it was." McCrea’s best showing was in Ward 22 (Allston/Brighton) where he received 6.6% of the vote. Menino came in 3rd place in one precinct: Ward 21-1 (Allston’s BU precinct). There, Yoon won 50 votes, Flaherty took 37, and the Mayor earned 34 votes. The BRA decided late yesterday not to hold a Charlesview meeting tonight, but there is still plenty that we can discuss as neighbors. Since many of us were already planning to be at the library tonight at 6, let's keep those plans and have a community discussion in preparation for the meeting on October 5. A nail for the Science Complex's coffin? Earlier this year we learned that Harvard "may slice a four-year, $4 billion [capital] spending plan to $2 billion" and today's Crimson reports that Harvard has re-affirmed its commitment to begin massive renovations to its undergraduate housing in 2012. Does Harvard have enough $ to begin renovating its "houses", finish the Science Complex, and renovate the Fogg (scheduled to be completed in 2013) all in the next few years? TOMORROW NIGHT’S COMMUNITY MEETING FOR THE CHARLESVIEW REDEVELOPMENT PROPOSAL HAS BEEN POSTPONED TO MONDAY, OCTOBER 5, 2009 AT 6:00PM AND WILL BE HELD AT THE HONAN ALLSTON LIBRARY. THE CITY’S CHIEF PLANNER, KAIROS SHEN, WOULD LIKE TO ATTEND THE MEETING BUT HAS A CONFLICT TOMORROW EVENING. I APOLOGIZE FOR THIS CHANGE IN SCHEDULE AND HOPE TO SEE YOU ON OCTOBER 5TH. Ciommo's GOTV operation was in a league of its own yesterday. He seemed to be the only candidate driving voters to the Honan Library and his campaign had two drivers going between the library and the McNamara House senior housing for most of the day. Every carload brought 2 or 3 Ciommo voters, many of whom got to ride in style in a gold Jaguar. The success of this operation is seen in the results from 22-5 where Ciommo crushed with 78% of the vote. Ciommo (113) got almost as many votes as Menino (86) and Flaherty (34) combined in this precinct. I was so proud last year when the lines were out the door of the Honan Library when such an amazing number of people came out to vote in the Presidential election. Today, not so much as only a slow trickle of people are coming out to vote. To both save money and increase participation, Kevin McCrea's proposal makes a lot of sense to me. He would have the next mayoral term be 3 years (instead of the normal 4) to get Boston's Mayoral elections into the same year as the Presidential elections. The Globe endorses Carlos “Tony’’ Henriquez who is running against incumbent Chuck Turner to represent Roxbury, and parts of the Fenway, South End, and Dorchester. But despite the vigorous 4-way race in A/B it garners not even a mention in this editorial. This afternoon (Monday) all neighbors are invited to join the Allston Brighton North Neighbors Forum (ABNNF) to complete our landscaping project at the Gardner Pilot Academy, 30 Athol Street. We will meet from 4-6:30 to plant a tree, several large bushes, and other plants. Tools will be provided and kids and adults of all ages are welcome. We have made a huge difference during the past few months. An unattractive area of asphalt is now green, alive, and beautiful! Thanks to everyone who has helped make this project a success! The Allston Village Street Fair is always a highlight on the Allston calendar every year. Thanks to Joan and all the other volunteers, musicians, and everyone else who helped make today's event such a great celebration of our diverse urban neighborhood. Where else could you find a drum and hula hoop jam as wild and wonderful as this? What to do with the Science Complex site? The Globe asked a variety of creative people what they'd do to transform the Filene's site, Columbus Center, the Longwood biolab, and the Harvard expansion in Allston until construction resumes. Miller - Use it as a new urban common. Activities could include a community gardens, climbing wall, skateboard park, and performance center. Powell - Build a quarter-mile projection screen on the fence surrounding the construction site. The images would be drawn from the neighborhood's past, present, and future. 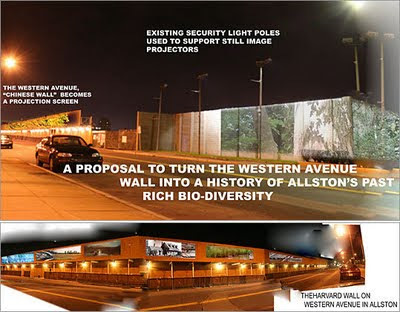 Projectors would be mounted on the utility poles next to the fencing, and installments would rotate and allow residents from the neighborhood to design or photograph pictures to be featured. While we are on the subject, this reminds me of these beautiful murals on construction barriers that Harvard showed the Allston community back in 2007. They sure look a lot nicer than the blank wall that Harvard put up instead. I'm surprised by both who the Globe endorses and that Harvard's aborted Allston expansion plays such a prominent role in the rationale. Flaherty contends that Menino... erred twice in controlling Harvard’s ambitions in Allston. First, Flaherty argues, the mayor failed to realize the university was buying up land on the sly, and then he held out too long for givebacks until the economy soured and residents were left staring at empty holes in the ground. All are reasonable criticisms. With election day just around the corner, I thought this was a nice sentiment to keep in mind as we evaluate the various politicians on the ballot. "Jim was a politician in the best sense: You pay attention to the community, you listen to the different constituencies, you listen to all the voices, and then you help find common ground." Thanks to Galen Mook, who is providing a great service to our community, for recording and uploading this video from the September 17 A/B City Council debate hosted by the Brighton Allston Improvement Association and moderated by Michael Pahre. Allston-Brighton City Council Debate, 9/17/09 from Galen Mook on Vimeo. Allston-Brighton City Council, pt 2 from Galen Mook on Vimeo. Candidate for Mayor Kevin McCrea will be at the Green Briar (308 Washington St) on Friday at 9pm. Come talk with us about bringing fairness and transparency to City Hall. Today (Firday, Sept 18) is the deadline for comments on the proposal for a 20-unit apartment building on Greylock Road. It is hard to imagine a project less consistent with the Allston/Brighton zoning and the goals of this community than the proposal for 17-23 Greylock Road. Allston is a neighborhood with very low homeownership and an overly transient population. Twenty more small apartments (average size 977 square feet) is not what we need. There is no hardship (as defined by Section 7-3 of the Boston Zoning Code) to justify these variances, only the greed of a developer seeking to profit while violating the intent and purpose of our zoning code and doing nothing to improve the quality of life in this neighborhood. Maybe Mr. Baskin, the Newton developer who is seeking these variances, should have been more careful before spending $1.6 million in 2006 to purchase the buildings that he now wants to demolish. In any case, zoning variances are not to be used to help investors who made unwise decisions. Thank you for conveying to the Mayor and Director of the BRA the serious concerns that many neighbors expressed about this project at the public meeting on July 30. I hope that you will all agree that these variances should not be approved. If my Twitter version of Thursday's debate isn't your cup of tea, we will have video courtesy of Galen Mook available in a couple days. Also, thanks to Adam Gaffin for attending and publishing Notes from an Allston/Brighton city-council forum. Adam notes that Councilor Ciommo has an e-mail problem. Personally, I think that Alex Selvig has a valid point about disclosure of emails between Ciommo and Menino chief of staff Michael Kineavy, but Alex's repeated pursuit of the issue during the debate was probably too aggressive for the taste of some voters. I am continually amazed how some lawyers, architects, and others will lie, misrepresent, mislead, and deceive on behalf of their clients. At last night's Allston Civic Association meeting, a woman being paid by Blanchard's Liquors sought support for a new "blade" sign that would rise vertically away from the building identical to the sign that Blanchard's already has on the Harvard Ave side of the building. Part of this woman's rationale was that from Brighton Ave it is too easy for people to miss the liquor store on the corner, even after Blanchard's expands into the Sunrise Market space and replaces the market's sign with a "specialty liquors" sign. How anyone could say that with a straight face is beyond me. It would be easier for residents to support the businesses in our neighborhood if the businesses would be more honest as they seek our support. Charlesview board chairman Rev. Samuel Johnson, who is also pastor of the Community United Methodist Church, said he thinks Harvard should commit to developing its Allston holdings. “I would hope that they would very soon -- quickly -- say how they plan to use the land and in writing pledge some of the land, particularly strategic pieces, to be used for housing and open space, in this area,” he said. But unfortunately Harvard still doesn't get it. Planning and development of the KMart / OfficeMax portion of Brighton Mills cannot be seperated from all of Harvard's other adjacent and under-utilized property. The [Charlesview] swap deal and housing project should be evaluated separately from development of Harvard’s other holdings in the district, Harvard’s McCluskey said. Developing Harvard’s land is “a longer-term, broader, much more complex process to engage in than focusing on this particular effort,” he said in an interview at the meeting. Those who followed the Clinton and Obama campaigns last year will notice a familiar name in Abigail Furey's campaign finance report. Furey received $500 from Patricia Doyle, a partner at the DC law firm of Utrecht & Phillips, who is more commonly known as Patti Solis Doyle. She was campaign manager for much of Hillary Clinton's presidential bid and later chief of staff for vice presidential nominee Joe Biden. Doyle is married to a cousin of Abigail Furey and has been providing informal advice to her campaign. Not much to analyze. $620 in, $461 out. Mark reports a $13,671 ending balance from his previous finance report and raised $35,316 between 1/1/09 and 9/4/09. 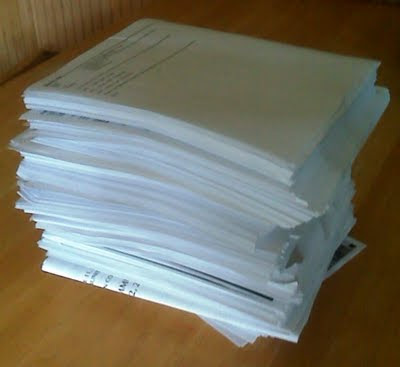 The candidates to represent Allston and Brighton on the City Council are submitting their campaign finance reports today. So that you can see where the money is coming from, I will be publishing these reports on this blog. Alex Selvig is doing some major self-financing in his second run for City Council. His total receipts for 1/1/09 to 9/4/09 are $68,465, $66,500 of which are loans that Alex has made to his own campaign. Kevin McCrea spoke this morning at City Hall Plaza about the willful and systematic deletion of emails by top officials in the Menino administration as reported in today's Globe and Herald. Comment Letters for Charlesview and Greylock Road Article 80 projects. "Kineavy has also used his position to help the city manage neighborhood dissent. In 1996, he disbanded the Allston Brighton Boston College Community Relations Task Force, which was sharply questioning the college’s expansion plans. He sought to replace it with a panel whose chairman he would appoint, saying he needed to rid the board of “people from outside the neighborhood’’ who were “controlling the group.’’"
Stopped, or just verrry verrrrry slow? It is funny reading in today's Harvard Crimson that "none of the work [on the Harvard Science Complex] has deviated from the initial plan". While it may be true that Harvard "will make a decision about whether to proceed with the project in December", it is also clear that work on the Science Complex has almost completely stopped, and that certainly wasn't in the plan that Harvard has presented during the past several years. Here are some views of the construction project from 1:45 this afternoon. During the planning for this project, Harvard said there would be several hundred construction workers. Remember all the time we spent talking about how Harvard would need to use the Sears site for construction worker parking because 400 parking spaces on the north side of Western Ave wouldn't be enough? Today I saw 3 workers there. This Harvard presentation on construction worker parking demand and trucks per hour shows that we should now be in the period of maximum construction parking demand (750 cars) with 1,000 workers on site. It is pretty obvious that the construction workforce has not ramped-up from 600 to 1,000 workers during this summer. The buildings above grade will be constructed of reinforced concrete frames. The structure will be erected from four electrically operated tower or street cranes within the Project site. There will be approximately ten 65-foot trucks daily during this operation. The concrete operation will involve daily concrete placements with up to 35 concrete trucks on pour days. When those 4 cranes arrive and we see a concrete truck arrive every 15 minutes we will know the project is back on track. The Faculty of Arts and Sciences, the University's largest school and home of Harvard College, drew 52 percent of its revenues from the endowment last year. Planning for a precipitous drop in endowment size has already resulted in $77 million in budget cuts at FAS, and administrators are looking to cut another $143 million this year from a budget of just over $1 billion." "The major exception is the part of Allston slated to become a new campus for Harvard University. Menino lost track of Harvard as it acquired property stealthily through proxies during the late 1990s. And he could only look on powerlessly when the economy faltered and Harvard shelved much of its plan to build 10 million square feet of new building space, leaving neighbors complaining about the vacant buildings in their midst." While I would agree that Menino can't do much when Harvard decides to stop its Allston construction, I doubt that he is "powerless" when it comes to negotiating with Harvard to allow development on more land to create a better new Charlesview. Thanks to the Globe for remembering our situation here. Tune in to Fox 25 from 5 to 6 to see the four candidates for Mayor. At the FOX 25 website you can submit questions for the debate and watch interviews with the candidates. Monday is the deadline for City Council candidates to submit a campaign finance report in advance of the Sept 22 preliminary election. This morning I asked the 4 candidates to send me their reports (Ciommo has already agreed to do so). They will be available here when I receive them. If I can't get them directly from the candidates I will try to get to City Hall next week to get them from the Elections Dept. This blog post by Candidate for Mayor Kevin McCrea suggests that A/B District Councilor is too close to Mayor Menino because Ciommo got Sam Yoon to "scale back" a hearing order about the BRA's handling of Boston College's Institutional Master Plan. Ciommo just gave me a heads up that Yoon is late filing an order on the BRA's process re: BC. Ciommo signed on and got him to scale back the language on it, but he said it is most likely coming from the Brighton Neighbors United group. It is critical of the board vote in January and the issue with the Zoning Commission in March. They didn't have the language yet, but they will get it to me as soon as they do. I'll keep you posted. I have not contradicted any aspects of my disclosure form. Councilor Yoon approached me to co-sponsor a late-file Order for a Hearing regarding the BRA process with Boston College's IMP. I provided him with my feedback that I supported several components of the Order for a Hearing, but that I thought that some of the language was inaccurate. I also felt that some of the language was politically charged. He agreed to remove the aspects that we discussed and I joined him in co-sponsoring the order. My intent was to remove politics from the discussion and focus on the BRA process. I think the end result was a more productive hearing. "Mark Ciommo has consistently worked to fund and improve urban greenspace, decrease Boston’s carbon footprint, support and improve Boston’s recycling rate, increase compliance with the state’s idling law, support the application of LEED standards, and support residential energy efficiency." Those all seem like admirable citywide projects, though as our A/B district councilor I am wondering what leadership Mark has shown on local environmental issues during his 2 years as City Councilor. Can anyone suggest some examples? The Boston Civic Design Commission had its first look at the new Charlesview proposal on August 4. For reference, the minutes from the BCDC's review in March 2008 are here. After a question about the project's financing, Commissioner Daniel St. Clair asked a straightforward question "Will it all be built at once?" and got a 'maybe' answer from Charlesview's lawyer who said "That's the plan." It would help if Charlesview would be more clear about what and when they expect to build or not build. The current proposal includes the construction of a new building for McDonanld's, just like the existing building surrounded by parking, but a few yards closer to Petco to accomodate the extension of Telford St. The commissioners repeatedly noted the importance of all 4 corners of the new Telford/Western intersection and I agree with them that a McDonald's parking lot would be a poor choice. Charlesview responds that "It's not for us to make changes on that side of the street. All we can show you today are our 8+ acres." To whom is Charlesview passing the buck on this? Why, Harvard of course, who could agree that a new McDonald's would be better integrated into the first floor of a building similar to the others that Charlesview proposes along Western Ave. Perpetuating the auto-centric and pedestrian-unfriendly mistakes in design made during the planning of Brighton Mills should not be repeated, and hopefully Harvard - whose planners so often emphasize the wonderful pedestrian-friendly design of their future campus - will bring the same sensitivity in design to this part of our neighborhood. Karios Shen notes that "Harvard has not yet responded" to the BRA's suggestions about uses for other nearby Harvard property. If Harvard hasn't responded after a year-plus of community planning, does anyone think Harvard will be more motivated to respond after this project approved and Harvard gets ownership of the current Charlesview property? The next item was a re-presentation of the Charlesview Project. PM introduced the post-baby Kairos Shen (KS), Chief Planner for the BRA. KS, working from several boards prepared by the BRA during the Community-Wide Planning Process (and also some prepared by the Proponent), said that the BRA had received feedback from many, including the BCDC, on the original Project. 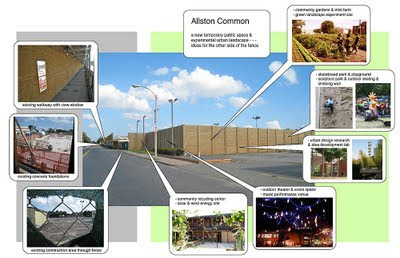 The North Allston Strategic Plan, prepared about 5½ years ago by Goody Clancy Associates, identified certain strategies and set the stage for the Harvard IMP, which the Commission has seen. KS noted a board showing the area with its key arterials, and areas owned by Harvard but not properly included within the IMP due to the nature of the uses. The development framework suggests a boulevard treatment along Western Avenue and North Harvard Street; part of the idea is to move the Charlesview Apartments to the Brighton Mills area, a Harvard land swap to accomplish its IMP. Retail is envisioned along Western between Barry's Corner and the next node (Everett Street), so the new location will be more in the community, and less an island of housing. Originally, the new site was smaller (about 5 acres); now it's about 7 acres. KS: We have also identified other development potential. Along the Holton Street corridor, we have a planned park, and additional housing as infill, with commercial edges along Western and Lincoln that might also be higher. KS: The affordability of the Charlesview is high, but it also has components outside of the replacement housing - a mix with market rate. (Shows a 'topographic' architectural plan along the Brighton Mills corridor.) The main fill is residential at the lower of the scales proposed. Overall, the total will be about 700 units in the 20-acre area, enough to support the retail. There is a lot of passion about this. It's not gentrification - but here, there will be units of more restricted income. There is a back story here: the local median income meets roughly the 50% of median general levels. We hope the Charlesview will form the anchor and basis of more residential development. Linda Eastley (LE): One question, about the Telford site - is it the intent to go residential along here over time? KS: Yes. The market-rate units are more there, but some now spread into the larger Project. The second phase of the Community-Wide Plan will look at these parcels, and will look at more housing. There is no planning along Storrow Drive, but there are suggestions and we've looked elsewhere (along the parkways). Residential makes sense. Daniel St. Clair (DS): What about the green spaces (in Holton corridor)? KS: Shaw's has a 20-30 year lease. But the other parcel has a shorter term. Harvard has not yet responded to these suggestions, but we are agreed that low scale residential housing development might be beneficial to the neighborhood. PM: Given the complexity, what are the public realm issues beyond the ordinary we might consider? KS: Streets. The current complex faces inward. They have tried to add new streets of a scale not different than the existing, to integrate the Project into the community. The income issue is raised, but in Charlesview the current household (avg. 2.5) income is $37.5K, and in the neighborhood it's $40K. There is a severe initial reaction to the Project. Is this the right balance between density and open space? We have thought some smaller scale spaces might help. Lynn Wolff (LW): Say more on Barry's Corner, and the connection to the River. We had focused the last time on the pedestrian connection across to that. KS noted the two nodes mentioned, and the eventual growth of commercial uses, but there is some natural discontinuity. This is a step toward a real transformation. The City wants to take advantage of the 213-unit renewal. LW: I think the node should shift. KS: I think it will shift that way; we should change the diagram. Deneen Crosby (DC): The other corridors - are those existing City streets? KS: Yes, it includes the Gardner School site. At first, we thought a transformative project might occur at Barry's Corner. Right now, it's a walk-through (vs. vehicular) connection. PM: Obviously this is an ongoing process. KS: The design team needs your input. Louis Miller (LM) introduced the team, including a member of the Charlesview Board, Felicia Jacques of The Community Builders, and David Hancock of CBT Inc.
LM: We want to thank the BRA planning staff and the community; it's a better Project. There are a lot of moving parts; the private side is also hard to put together. HUD had to have national legislation to allow this shift, for example. DS: A quick question - can you touch upon the financing? LM: We are fortunate; we have MHFA backing, and a private investor lined up for the housing credits. Also there is significant infrastructure, eligible for federal funding. Harvard is also contributing. DS: Will it all be built at once? LM: That's the plan. The affordable component is significant; it will all be done the same time. David Hacin (DH): Has the McDonald's been redone? Hancock: It has, on the model. David Manfredi (DM): Can you describe the parking? Hancock showed the extent of the parking pointing to the model, noting two entries and four pedestrian access points. He pointed out the surface elements, including small spaces next to the ownership units. LE: I would love to see Telford and Western as a much stronger gesture. Something which connects. The desire line is on the eastern side, where the bridge is. It's a shame, a lost opportunity, to let the McDonald's still be suburban in its attitude. Hancock: It's not for us to make changes on that side of the street. LE: But you have a park there. Hancock: In the interim, there's not much traffic on Telford, it's easy to cross. LM: All we can show you today are our 8+ acres. Andrea Leers (AL): Looking back, and with what KS said, this is light-years ahead (of where you where). There are many good, strong things. The north side of Western Avenue makes a good deal of sense. Now, it's a placeless place. You have done a lot to capture the flavor of the neighborhood with the groupings and the scale of the buildings on Western. Areas to work on include the transition between the higher and the lower. I would look at whether houses can fit into that group. You almost have a very nice situation with fronts on streets, and back yards, and shoulders. It's almost a mews. I would look at houses and strengthen that consistency. Hancock: At the corners, there are entries on both sides. AL: Most addresses are on the cross streets...continuous. DC: Does your Project include the opposite side of the Telford Street Extension? DC: The connection to the River, the opens spaces off of it; I can see it being used. What is the street section? We need more information. Picking up the other side - also sections. The garage underneath gives constraints on landscaping. Hancock: Yes, there are no mighty oaks. But we plan a continuous 2-3 feet of soil, large shrubs, and decorative trees. LW: There is a one-two punch for the landscaping - create a real green island by eliminating parking spaces - it would give (Telford Extension) oomph. I would re-think that. This is 100% better. DH: The plan is much better; the comments are good. On McDonald's, I don't know how decisions are made, but it would be great to have it sit on the corner with one of their new models. That would strengthen the street wall. DM: A good comment...also Andrea's. This is greatly improved. I keep going back to the intersection at Telford, with McDonald's holding the corner. That section of Western - in the future, how do you tame it? It's not your client's job, maybe - but you really could a big yellow (node) dot. I'm not sure how the edge of that building should address that corner. You should reinforce Telford as a pedestrian path and set up a rhythm for the other three corners. It's a key moment. Hancock noted there was an open space at the corner (introduces Andrew Wang and David Ferris of CBT), and agreed that maybe McDonald's could help set that up. AL: The end piece will set up your property very visibly for some time. It's an important face, and the space formed by the two buildings is important - as are the two buildings. DS: The major topics have been hit consistently. In Design Committee...the elevations don't seem as developed as the other thoughtful gestures. This has been a transitional area for 50 years, so maybe it is a place for a more industrial look. Hancock: Usually we have more of one. DS: You do have one, in this area. PM: And this is an industrial edge. Andrew: We have thought about the industrial loft buildings you reference. We're using precast, brick, and a balance of bays and larger windows (shows preliminary elevations). LW: It looks like you are beginning to address the corner. PM: Are there members of the community who wish to speak? Brent Whelan (BW): We have formed a group, and have had many meetings, and we are fortunate to have had the pro bono services of Sy Mintz, resulting in a plan which is for the area. Mr. Carlson has suggested that is more appropriate in Committee. The main themes are the distributions of affordability and owner-occupancy. This Project reproduces the model of wealthy people on one side, and poor on the other. It's not as integrated as it could be. It's still demographically a 'housing project' plopped in the middle of the community, although it looks like one less than before. Harvard has not been gracious in using their landbank for development; we feel that should move forward before this does. When do we know when that will proceed? All we'll have is Section 8 units. We want the Charlesview, but segregated (sic). PM: I encourage a focus on design and not socioeconomic issues; I don't want to disappoint with our inability to influence the latter. It would be great to have some readers of this blog join us tomorrow on Everett St from 5:30-7 to weed and water and help keep this part of our neighborhood looking green and great. "Menino can point to a steady increase on statewide assessment tests since 1998. His critics can point to a system that falls short on helping students reach the next stage of proficiency. He can point to progress on the dropout rate. They can point to flat graduation rates and racial achievement gaps. On and on. Perhaps he deserves a gentleman’s C for his handling of the schools. But the larger point is that he shouldn’t be a gentleman if given another four years in office." On a more personal note, my family is very much looking forward to the start of school later this week when our son will be in first grade and our daughter in K1 at the BPS Gardner Pilot Academy. The Gardner may be one of the three-quarters of the city’s 135 schools classified as "in need of improvement" but for us this is a case where an overall statistic for the school bears no relation to our individual experience. With a couple other neighbors who have been active on the Charlesview project, I had the pleasure of attending the Brighton Allston Improvement Association meeting last Thursday and talking with their members about the proposed Charlesview relocation and expansion. The BAIA is a savvy and experienced group, and we had an interesting discussion about how the Charlesview issues - creating a more stable, diverse, and family-friendly community - are related to many other development issues across Allston and Brighton. Thank you to BAIA President Donal Carroll for giving me us the opportunity to lead this discussion, and thank you to Abigail Furrey for informing us that Charlesview was on the BAIA agenda. The Sierra Club endorsed Mark Ciommo's reelection, though I can't think of much Mark has done during his two years in office stand out as a champion of the A/B environment. At the same time, I don't think he has been hostile to the environment either. I've emailed the Sierra Club to try to find out more about their thought process, and in the meantime you can take a look at the candidates' website and consider who is the "greenest" candidate. It seems like every September our elected officials and other City employees act all serious as they walk around Allston with the media in tow talking about landlords who rent dirty, unhealthy, and/or unsafe apartments. This year the tour went down Wadsworth Street, right around the corner from Linden and Ashford Street where they stopped in 2006. "Accumulation of six or more points on a permit for a dwelling unit during three consecutive annual permit periods could subject the owner to proceedings which could revoke the landlord permit"
In the grand scheme of things, this is a relatively simple problem to solve. Do our elected officials really want to solve it and can't figure out how? Or do they just like talking about the problem but don't really care about solving it? The Globe takes a look at BU's newly opened 960-bed Student Village II dorm in the southeast corner of Allston - "perhaps the most opulent residence hall to ever grace the local college landscape". Hopefully this helps shift the balance in Allston a bit from student rentals towards owner-occupied homes. There is also this fun time-lapse video showing Boston's range of weather and the construction of the tower. "Now independent curators and entrepreneurial artists like Mr. Tarrant are stepping into the breach, persuading landlords and municipal councils to turn vacant spaces over to them temporarily. Galleries have sprung up throughout the country, and particularly in London, in spots as varied as shopping mall outlets, a scooter showroom and a video store." Fredy Zepeda was killed last month after an alleged hit-and-run on Cambridge street as he loaded his 1-year-old son in his car. A fund has been established to help his family who are in need of financial assistance due to this tragedy. More information is available here.